I love that we can find the humor in our hair struggles. I mean, all we ever really want is a little control over the outcome…is that too much to ask?? From battling the innate tendencies of our hair to the unpredictable, sometimes sudden, changes in our environment, black hair continues to exert its independence and fight us at every turn. What’s a girl to do but express herself? Check out these hair memes illustrating the good, the bad and the ugly. Natural curl is naturally controversial. Necessary prerequisites for dealing with naturally curly hair. What part of naturally curly hair don’t you understand? At least our beautiful tresses are getting the attention they deserve. After all, didn’t it take hours to make it look this good?!! Hair confusion, step by step. Conspiracy theorists swear they left something out to mess with you. Pump up the volume…curly hair edition. When “living the dream” means hoping against hope for a different outcome despite past experience. Let’s just say size matters in more than one category. Did they ever tell you there’s no such thing as too much of a good thing? They were wrong. Are your edges beyond reason? Good news, you didn’t give up. Bad news, you’re out of gel. If Allstate insured edges, they’d be paying out on claims for days. Doesn’t this always happen when there’s no one around to witness it. Have you met my hair yet? It has a mind of it’s own and it’s not afraid to use it. The problem: You don’t always get the ones you like. Black hair: often misunderstood but never overlooked. Excuse me but that’s not frizzy. Count yourself lucky you got some volume out of it. 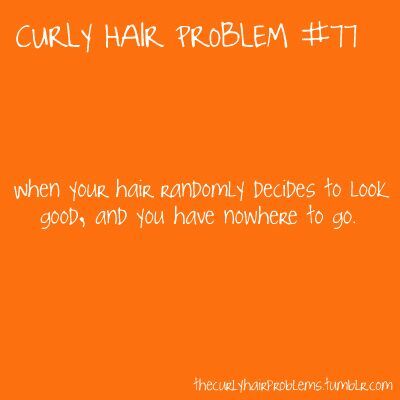 Non-curlies just don’t get it. All things are NOT created equal. Only if there’s a diffuser attached to it. Now you see it. Now you don’t. We’re not magic. We just have hidden talents. Ch-ch-ch-chia…just add water and watch it grow. You can run but you can’t hide. Moisture’s gonna find you. Twist and SHOUT. The Beatles sang about the frustration of this style before its time. When you reach that point of no return, tell yourself, “It’s meant to look like this.” Then pray you start a trend. The gamble for successful hair is high stakes, but addicts keep going back for more. The effects when time is not on your side. After 8 hours of washing, drying, setting and styling, you’d sleep standing up if you could. Looking to go out? You’d best put your hair on notice or find some way to leave it behind. Interrupt beauty regimen at own risk. You’ve been warned. There is nothing quick about curly hair, except how quick it is to misbehave. Days like this have you calling every last number in your phone looking for a night out. Revealing the truth about black hair. Forget length check. Try reality check. Each type of curl has it’s own set of instructions. One does not cancel out the other. Making the most of what you’re working with. From hidden treasure to boosted beauty. WARNING: Photo on label is not an accurate representation of contents. Are you “touched in the head”? There is NEVER an invitation to touch my hair. Trespassers beware! There is no age limit to restricted access. You know you’re serious about your hair when you pray for divine intervention. Contain yourself. The following illustration is merely a dream sequence and is not based in reality. Relaxed or just plain contained? When going straight gets misinterpreted as an act of conforming rather than a statement of style. Happiness is a perfectly round fro. You’d better notice. It took 4 hours to make this happen. Has your child confused taking a nap with having a relaxer? Ya, right. If time only stood still. Ain’t nothing more important than the right do. Sleep in the stylist’s chair. After 20 years of getting braids, why does this always surprise you? Wash day is a way of life. Don’t let them convince you that it’s optional. Now trending #prewashdayweek, during which you build up the energy you need to get through wash day. Not to be confused with unicorns and leprechauns. Getting the hair you want. Black Hair Care = Control Issues! Ain’t nothing or nobody gonna dictate my hairstyle. Eyes wide open. Do you suffer from hair care amnesia? Call curly hair crisis hotline and be reminded what life was like pre-protective style. Don’t be brainwashed into thinking you don’t have choices. Brushing means bushy, full stop. So, just stop. How many broken brushes does it take to look like this? Beware…excessive detangling can cause pre-mature aging. She’s actually 36 in this picture. Achieve your very own platinum level badge at hair hide ‘n seek. You never know what treasures you may find. Evidence that your hair is alive. It eats hair pins for breakfast. Just like in childbirth, you forget the pain right after you see the results. Proceed with caution: Insert hands at own risk. Arms defined by hair(s) crunches. Built-in convenience for those who like to go without a purse. Some say “different” like it’s a bad thing. Redefine your different. A dime? That’s the change you get from the 10-quarter-sized amount you actually need. The hair race is like a marathon not a sprint. However, there’s always one more lap to go even after you cross the finish line. After looking at all the kinks and quirks of naturally curly hair, it’s important to end on a positive note. All things in life have a yin to their yang. It’s necessary to create balance. Black hair stylists have been the most successful at turning perceived negatives into positives. The door has been swung open wide with style possibilities and trendsetting that has impacted the entire hair industry. Celebrate the beauty of black hair. Nothing is more versatile and truly showcases our individuality. Loving yourself is loving your hair. Confidence means choosing your own way. Because being yourself is way better than being like someone else. Celebrate your royalty. Wear your curls with pride. Love the hair you were born with. It’s your calling card. It was uniquely designed for you. Tiffany Haddish: Break-Out Style Vixen What is Castor Oil?